Part one of a two-part respiratory protection series from the industry experts at Builders Mutual. Crystalline silica, commonly referred to as quartz, is a basic component of soil, sand, granite, and many other minerals. While it may sound harmless, it can create serious health risks. When construction workers chip, cut, drill, or grind objects that contain silica, such as brick, concrete, or HardiePlank, the particles released may become respirable. On March 24, 2016, OSHA announced its final rule on Occupational Exposure to Respirable Crystalline Silica. Let’s discuss the ruling, as well as the Table 1 standard. The compliance date for the new rule for those in the construction industry was September 23, 2017. The rule reduces the permissible exposure limit (PEL) for crystalline silica from 250 to 50 micrograms per cubic meter of air (μg/m3), averaged over an eight-hour shift. Respirators are allowed as the sole type of protection only when engineering and work practice controls cannot maintain exposures at or below the PEL or when other methods are infeasible. We will discuss controls more thoroughly in part two of this series. For reference, the standard includes Table 1, a list of common construction tasks along with exposure control methods and work practices that can be used to comply with the requirements of the standard. Employers who follow Table 1 correctly are not required to measure workers’ exposure to silica and are not subject to the PEL. 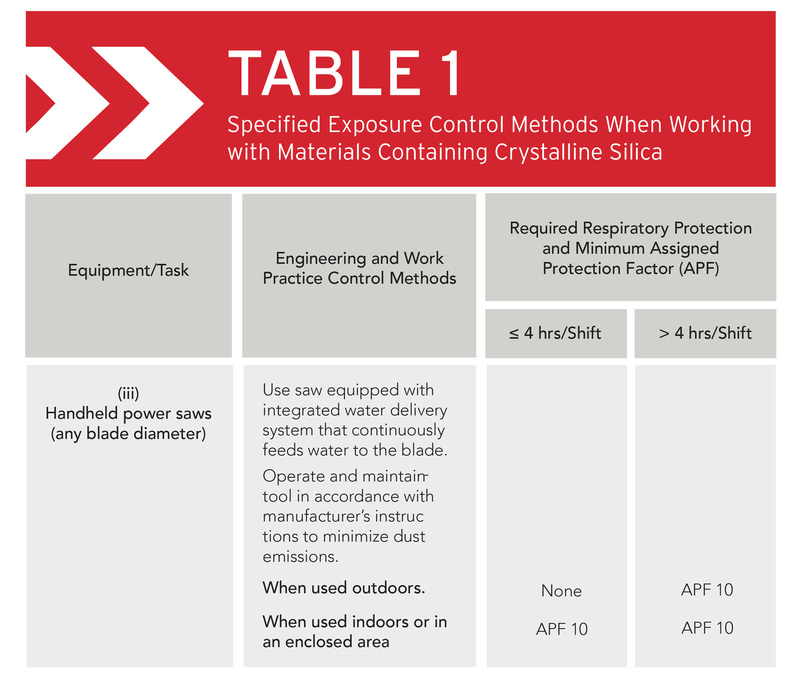 The chart explains that when workers are using handheld power saws to cut silica-containing materials, they can use a saw with a built-in system that applies water to the saw blade. The water limits the amount of respirable crystalline silica that gets into the air. Additionally, if a worker uses the saw outdoors for four hours or less per day, no respirator would be needed. If a worker uses the saw for more than four hours per day outdoors or any time indoors, he or she would need to use a respirator with an assigned protection factor (APF) of at least 10. In this case, a NIOSH-certified filtering facepiece respirator that covers the nose and mouth (sometimes referred to as a dust mask) could be used. If a worker needs to use a respirator on 30 or more days a year, he or she would need to be offered a medical exam. In addition to this overview, Builders Mutual has compiled the following list of free resources to help educate our policyholders about the final rule on Occupational Exposure to Respirable Crystalline Silica for construction, Table 1, and ways to comply. Up next, read about implementing approved methods for controlling respiratory hazards on the job-site here. “Do You Have Questions About Disposable Dust Masks? We Have Answers!”EHS Today. October 12, 2017. “Respiratory Protection Selection Made Easy (Or At Least, Less Confusing)” EHS Today. October 12, 2017. “OHSA’s New Silica Rule – Overview and Resources”Builders Mutual. 2017. “Silica in Construction Toolkit” National Association of Home Builders. 2017. “OSHA Crystalline Silica Rule: Construction” OSHA. 2017.